7. there has been too little information provided in studies of the effect of dietary factors on the affected population, which would entail nutrigenomics. 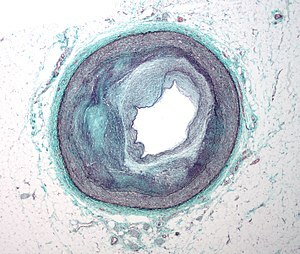 8. there is an association between certain distinct CVD’s and later development of coronary heart disease (CHD). Background: Cytochrome P450 (CYP) 2J2 is expressed in the vascular endothelium and metabolizes arachidonic acid to biologically active epoxyeicosatrienoic acids (EETs). The aim of the present study was to assess the association between the human CYP2J2 gene polymorphism and coronary artery disease (CAD) in a Han and Uygur population of China. a Uygur population (336 CAD patients and 448 control subjects). of CYP2J2 gene by a Real-time PCR instrument. Results: In the Uygur population, for total, the distribution of SNP3 (rs2280275) genotypes showed a significant difference between CAD and control participants (P=0.048). showed a significant difference between CAD and control participants (for allele: P=0.014 and P=0.035, respectively; for dominant model: P=0.014 and P=0.034, respectively). The significant difference in dominant model was retained after adjustment for covariates (OR: 0.279, 95% confidence interval [CI]: 0.176-0.440, P=0.001; OR: 0.240, 95% CI: 0.128-0.457, P=0.001, respectively). Conclusions: The CC genotype of rs2280275 in CYP2J2 gene could be a protective genetic marker of CAD and T allele may be a risk genetic marker of CAD in men of Uygur population in China. 1. We used two independent case-control studies: one was in a Han population and the other was in a Uygur population. 2. The CC genotype of rs2280275 in CYP2J2 gene could be a protective genetic marker of CAD and T allele may be a risk genetic marker of CAD in men of Uygur population in China. 3. Polymorphism of the CYP2J2 gene can affect the synthesis of epoxyeicosatrienoic acids (EETs). This article describes the association between CYP2J2 polymorphism(SNP1, SNP2 and SNP3) and coronary artery disease (CAD) in two populations of China (Han and Uygur). that CC genotype of rs 2280275 is significantly lower in CAD patients than in control subjects. It appears that CC is the homozygous and dominant state of this SNP3 sequence in a pairing-combination. The effect of decreased CHD is seen only in the CC double combination, in men and not women. The difference between men and women with CAD is in LDL. (1) after adjusting major confounding factors such as Glu、LDL、EH、DM and smoking, the effect of decreased CAD is seen only in the CC double combination, in men and not women. (2) for men, the LDL level is higher in CAD than in control, for women, there isn’t a difference of LDL level between CAD and control. (3) for men, the distribution of T and C allele is different between CAD and control (p=0.035), and not in women (p=0.118). The T allele of SNP3 is increased in CAD. So the C allele is important, and a CT pair is neutral. Neither SNP1 or SNP2, or presumably both have lower incidence. because of the intimal enzymatic conversion of arachidonic acid to EETs. Arachidonic acid is a derivative of linoleic acid,an n-6 PUFA, while linolenic acid is an omega-3 PUFA. Substantial documentation of the effect of EETs is given. The anti-inflammatory advantage of an n-3 PUFA is also known. It appears that the intimal conversion results in an omega-3 product. In addition, the EET activates eNOS, so that there is endothelial NO produced. The studies of both Spiecker and Ping Yin Liu showed the polymorphism of CYP2J2 (rs890293, SNP1) has relation with CAD. However, in this study, the authors found there was no association between the polymorphism of CYP2J2 (rs890293, SNP1) and CAD in Han population and Uygur population. We found (rs 2280275, SNP3) has association with CAD. All participants had a differential diagnosis for chest pain encountered in the Cardiac Catheterization Laboratory of First Affiliated Hospital of Xinjiang Medical University. We recruited randomly CAD group and control group, subjects with valvular disease were excluded, control subjects were not healthy individuals, some of them have hypertension, some of them have DM, some of them have hyperlipidemia, which means control group expose to the same risk factors of CAD while the results of coronary angiogram is normal. All control subjects underwent a coronary angiogram and have no coronary artery stenosis. The analysis was a logistic regression analysis, we used the major variables of CAD to analysis and found the CC genotype was the dependent useful factor after adjusting for major confounding factors such as Glu、LDL、EH、DM and smoking. Schematic of EET interactions with cardiovascularion channels. A: In the cardiac myocyte, EETs activate sarcolemmal or mitochondrial KATP channels. B: In the vasculature, EETs activate endothelial small-(SKCa) or intermediate (IKCa)–conductance calcium-activated channels to cause hyperpolarization, which can be transmitted to the vascular smooth muscle via myoendothelial gap junctions. EETs also activate TRPV4 channels to activate Ca2+influx. In the vascular smooth muscle, EETs activate large conductance, calcium-activated (BK-Ca) channels through a G protein-Coupled event. C: In platelets, EETs activate BK-Ca channels.calcium-activated (BK-Ca) channels through a G-protein-coupled event. C, In platelets, EETs activate BK-Ca channels. Results from the published studies on the association of ADRA2A (adrenoceptor alpha 2A) variants with type 2 diabetes (T2D) are conflicting and call for further assessment. The aim of this meta-analysis was to quantitatively summarize the effects of the two recently reported ADRA2A single nucleotide polymorphisms (SNPs) rs553668 and rs10885122 on T2D risk. Twelve studies with 40,828 subjects from seven eligible papers were included in the meta-analysis. 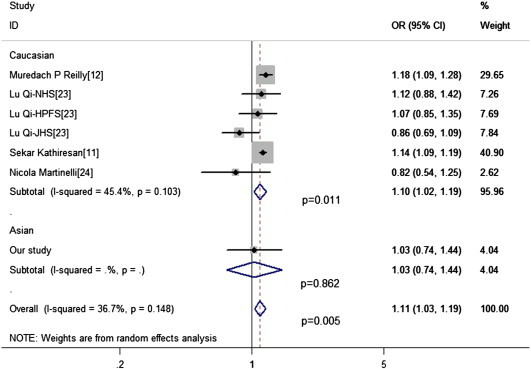 Overall, the present meta-analysis failed to support a positive association between ADRA2A SNPs (rs553668 and rs10885122) and susceptibility to T2D (OR = 1.05, p = 0.17, 95% CI: 0.98, 1.12; and OR = 1.06, p = 0.11, 95% CI: 0.99, 1.13; respectively). However, in the subgroup analysis by ethnicity, the significant association between rs553668 and the risk of T2D was obtained in Europeans under the recessive genetic model (OR = 1.36, p = 0.02, 95% CI: 1.05, 1.76). The results of the meta-analyses indicated that both SNPs were associated with CHD in Caucasians (P < 0.05) but not in Asians. The results from our case-control study and meta-analyses might be explained by genetic heterogeneity in the susceptibility of CHD and ethnic differences between Asians and Caucasians. Lina Zhang, Fang Yuan, Panpan Liu, Lijuan Fei, Yi Huang, Limin Xu, et al. ► Association of rs11206510 and rs1122608 with CHD in 813 Chinese participants. ► The first association test of rs1122608 with the risk of CHD in Han Chinese. ► Meta-analyses were performed for rs11206510 and rs1122608. ► The two SNPs were associated with CHD in Caucasians but not in Asians. To explore the association of rs11206510 (PCSK9 gene) and rs1122608 (LDLR gene) polymorphisms with coronary heart disease (CHD) in Han Chinese. A total of 813 participants (290 CHD cases, 193 non-CHD controls and 330 healthy controls) were recruited in the case-control study. DNA genotyping was performed on the SEQUENOM® Mass–ARRAY iPLEX® platform. χ2-test was used to compare the genotype distribution and allele frequencies. Two meta-analyses were performed to establish the association between the two polymorphisms with CHD. No significant associations between the two SNPs and the risk of CHD were observed in the present study. The meta-analysis of rs11206510 of PCSK9 gene comprises 11 case-control studies with a total of 69,054 participants. Significant heterogeneity was observed in Caucasian population in subgroup analysis of the association studies of rs11206510 with CHD (P = 0.003, I2 = 67.2%). The meta-analysis of LDLR gene rs1122608 polymorphism comprises 7 case-control studies with a total of 20,456 participants and the heterogeneity of seven studies was minimal (P = 0.148, I2 = 36.7%). The results of the meta-analyses indicated that both SNPs were associated with CHD in Caucasians (P < 0.05) but not in Asians. I Eleftheriadou, P Grigoropoulou, I Moyssakis, A Kokkinos. et al. Elevated plasma homocysteine (HCY) levels have been associated with increased risk for cardiovascular disease. Aortic distensibility and aortic pulse wave velocity (PWV) are indices of aortic elasticity. The aim of the present study was to determine the effect of acute methionine-induced HHCY on aortic distensibility and PWV in healthy individuals and the effect of acute HHCY on myocardial performance of the left ventricle (Tei index). Thirty healthy volunteers were included in this crossover study. Aortic distensibility and Tei index were determined non-invasively by ultrasonography at baseline and 3 h after methionine or water consumption, while PWV was measured by applanation tonometry at baseline and every 1 h for the same time interval. Oral methionine induced an increase in total plasma HCY concentrations (P < 0.001), whereas HCY concentrations did not change after water consumption. Aortic distensibility decreased 3 h after methionine load (P < 0.001) and Tei index increased (P < 0.001), suggesting worsening compared with baseline values. Water consumption had no effect on aortic distensibility or Tei index values. PWV values did not change after either methionine or water consumption. Acute methionine-induced HHCY reduces aortic distensibility and worsens myocardial performance in healthy individuals. Further research is warranted to examine in the long term the direct effects of HHCY on cardiovascular function and the indirect effects on structural remodeling. So if I am to understand, the CC allele for the polymorphism in the CYP2J2 gene, after taking into account diet, was the only SNP that could be correlated to Lower CVD risk? 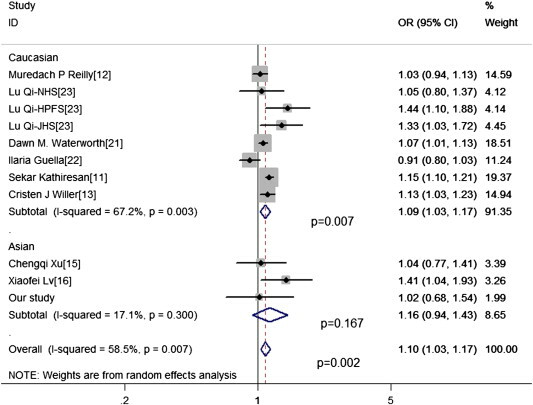 The other genes did not show any correlation in the meta analysis? I could understand this however is there any functional difference in arachidonic acid metabolism between the CC and T SNP? The answer is probably no, but it was not explored. I had not asked that question, because it wasn’t at all a major part of the study. 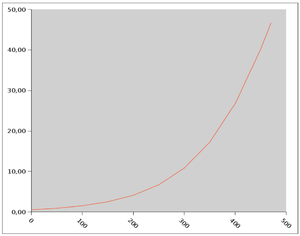 So it comes down to whether only one of the necessary CC alleles has an effect = 0 + 1 (T + C). This is related to ONLY C + C having lower risk. You are asking why both alleles would be needed if the C recessive CYP2J2 allele (075) has the protective effect, and one would infer that there was a dose relationship (01,10, 11). It looks Mendelian without the alleles that give (00, 01, 10, 11). If you consider all of the alleles, then you have the following: 00, 01, 01, 10, 10, 11), is that the right presentation for the 2 non Ts (not C). So that presses you to ask if the CC has an effect, why not a CT having less, but a linear 1/2? 1. It is derived from linoleic acid, so it was removed as an original ESSENTIAL FA. 2. We don’t associate it with having an antiinflammatory, rather than proinflammatory effect. 3. The authors drew up a model explanation for the C interaction. The plan to explore the arachidonic acid in another study, but they were not tooled up to do the studies needed. So the effect of diet as well as the arachidonic could tie thing together with a dose-related conditionally-essential fatty acid that has not been described. In order to be an effect, there has to be two C alleles. How much fish and soy would it take to have squeeky clean arteries? What about the cancer risk? What is the difference in age between the Han and the Uygurs?